Start with a tent and work from there when assembling your camping arsenal. Many Inland Northwest residents consider it criminal to miss out on the natural wonders readily available here, and can't imagine life without occasionally packing up and hitting the backcountry, away from the travails of city life. I plead guilty to neglecting our outdoorsy opportunities, particularly backpacking and camping. 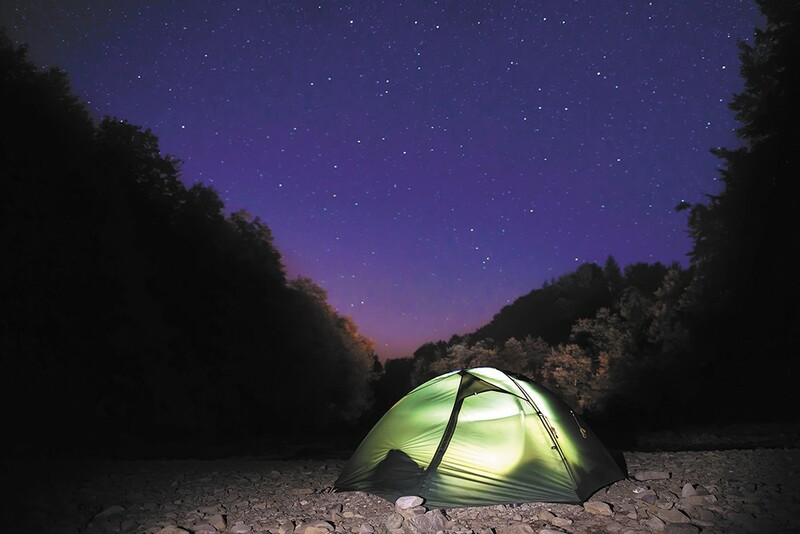 Most of my experience in those pursuits is relegated to a few half-assed years as a Cub Scout, and I'm pretty clueless as to just what I need to spend a night under the stars. Obvious, right? But not all tents are created equal. For a two-person tent, you can easily spend anywhere from $50 to $500; "the lighter the tent, the higher the price," Schwartz notes. Expect to get cozy with your fellow trip-taker, or you might need something bigger. And while most prioritize the tent's weight, Schwartz says that's a mistake: "Ventilation is the last thing people ask about, but it's the first thing you need to think about." So be sure to ask the salesperson how well your tent lets the air through. Rocks and uneven ground conspire to keep you from comfortable snoozing. There are plenty of sleeping pads on the market to help, from the $54 RidgeRest pad to a luxurious $160 Therm-a-Rest NeoAir XLite pad. What you require, Schwartz says, depends on "how old you are, what kind of comfort you want, and how long you're out there." Same goes for your sleeping bag; you can choose between long-lasting (but more expensive) down bags or cheaper synthetic-filling bags that might be just fine for a weekend warrior. It all depends on how warm you need to be. As Schwartz notes, "July on Mt. Rainier is different than July at Priest Lake." All backpacks might look alike to you, but Schwartz is quick to note that there are a lot of things to consider. "We're going to play 20 questions with you" to figure out the best pack, he says. Men and women have different shapes and need different packs, and you'll want to try several on to determine what's right for you. This is where the decision to backpack instead of car-camp looms large. Instead of a cooler full of goodies, you'll want to pack light and get some surprisingly tasty freeze-dried meals. Small camping stoves have gotten a lot better, Schwartz says, and the more efficient models like a Jetboil stove will boil all the water you need for coffee and those meals-in-a-bag. A water filter is also a must to protect you from bacteria, whether you get a fancy 4-liter Autoflow Gravity Microfilter or use some tablets or drops to clean your water. "You can survive without food," Schwartz says. "You can't survive without water." You want breathable layers that protect you from the elements and are easily shed when the day heats up, Schwartz says. Skip the jeans in favor of nylon and polyester, and wool socks are "a better bet than any cotton sock." Comfortable hiking shoes or boots are a necessity. "You can spend $10,000 on gear," Schwartz says, "but if you have the wrong clothes, you're going to be miserable." You want to see, right? • Mountain Gear, 2002 N. Division in Spokane, rents select gear and hosts classes and special events, in addition to doing expedition consulting. • North Idaho College's Outdoor Pursuits program rents backpacks, tents, sleeping bags and pads, water filters and more to the public. Visit nic.edu/op for more info.